I had been looking forward to my holiday in France for a long time, eager to experience a new culture and lifestyle. Before leaving, I promised to write an e-mail to my family and friends everyday to share all my adventures with them. I knew it wouldn’t take up much time thanks to the typing lessons I took in school with plenty of typing practice under my belt and the impressive 105 I scored on a wpm test recently. As soon as my feet landed on Parisian soil, I knew why everyone raved about this city back home. Everything was different in a nice way; the language, the food, attire and attitude. “Hi, I made it safely toParis. Tell mom not to worry about me; I am at a nice woman’s home. Imagine my horror to find that almost all of the words made no sense! All my Qs and Ws were replaced with As and Zs. I had misplaced punctuation marks, and letters were interchanged with numbers; both my e-mail draft and my mind were a mighty mess. Sitting there in that internet cafe, totally confused and frustrated with my keyboard problems, I was sure someone was playing a prank on me by switching around the keys. Little did I realize that the culprit was the standard keyboard layout in some European countries; I wasn’t even aware that something called AZERTY existed. It took me a good hour to find the right keys and fix the mistakes in my first e-mail. This reminded me of my hunt-and-peck days before I started taking typing lessons. I could just imagine sitting down with my friends once I got back, trying to convince them this was a true story. They just wouldn’t believe that I, the typing test wpm champ of the group, had so much trouble writing a short e-mail. Oh, how I missed my good old QWERTY keyboard. It definitely took away some of the charm ofFranceand made me home-sick. Actually, I blame myself for not preparing properly for the foreign trip. If I was expecting these AZERTY keyboarding changes all over the country, it would have reduced some of the initial shock and saved me some precious time, which I could have used to go sightseeing and shopping instead! Anyway, it’s just another valuable lesson in life. Now I will have to learn to type on a foreign keyboard in my spare time, especially if I plan on living abroad for a long duration. I can experience a new culture like I always wanted, and I have an interesting anecdote to narrate as a bonus. For most people diagnosed with dyslexia, the world is an even more complicated place than ever, full of pitfalls at each turn. That exam you have to take, the interview scheduled next week or, the paper that needs to be turned in on Monday. These are all areas of your life that can be affected by a way of processing information that many people don’t really understand. Touch typing can help many dyslexics conquer what society deems a disability. But before we go into the hows and whys, let’s take a look at what dyslexia is. Dyslexia is a language processing disorder that affects a person’s ability to read, write, spell and sometimes speak. It’s not something that comes on suddenly, but rather a disability that some people are born with. And, although it’s been labeled a disability, it is really just a different way of processing information. People with dyslexia might experience changes in the way they process information over time. These changes can become quite complex and range from transposing letters while spelling to difficulty with grammar and writing on an in depth level. To those who do not understand dyslexia, it may look like the person who is dyslexic is lazy or lacks intelligence. However, it has nothing to do with IQ levels or motivation and the drive to learn. Rather it is based on the way that the brain processes information. For the dyslexic, one skill must first be committed to long term memory before learning another. Most classroom learning focuses on learning multiple skills at once which leads to overload of the working memory in dyslexics and ultimately: frustration. This presents a number of challenges to the person who struggles with dyslexia on a daily basis and can have a negative impact on grades, work performance and self image. Touch typing is one of the most effective ways that people with dyslexia can function in the real world. In fact, it can be used as a learning and communication tool in ways that traditional handwriting cannot. How can touch typing help dyslexics? For many young dyslexic students, touch typing helps cement other skills like reading, spelling and vocabulary to memory. Students who learn touch typing at an early age do better on tests that involve these skills and this holds true for both dyslexic students and those who are not. Typing offers a new way for dyslexic students to learn. Muscle memory allows spelling to become a series of patterns on the keyboard making it much harder to inadvertently misspell or transpose words. Handwriting is a particularly challenging skill for dyslexics. That’s because mistakes take longer to correct, papers often end up messy with eraser marks or cross-outs and students lack the benefit of using a spell checker. Even for people who do not suffer from dyslexia, touch typing is an easier, faster and more efficient way of getting work done. Touch typing has been shown to actually help handwriting in dyslexics. This might be because touch typing allows for more freedom and experimentation in writing styles. Because of the way the dyslexic brain works, people with this disability have much more success being able to capture their thoughts on paper or through a computer screen first and formatting and structuring that information later on. The benefits of touch typing are plentiful. From helping dyslexic students communicate more effectively to allowing them to compete in the real world through harnessing a new skill one thing is for sure: touch typing truly is for everyone. In most schools, language lessons for children focus on three main aspects: speaking, reading and writing. In the modern cyber-age, a fourth aspect is equally essential: touch typing. School children are being exposed to computers and taught to use Windows, PowerPoint, Excel and other useful applications, but they must also be exposed to touch typing lessons in primary school. When do Kids Need to Type? Kids can use mobile phones, laptops and tablet devices at a very young age. Soon they will start keyboarding online using these devices for leisure activities or to work on various projects and essays for school. If they are not given touch typing lessons right at the start, they will naturally use the two-finger style of typing. This can develop into a bad habit that is very difficult to change later in life. At What Age Can Kids Learn Touch Typing? Touch typing is a basic skill that needs time and practice to develop to perfection. Young kids have a great ability to learn; their minds are like sponges. When they start learning the position of characters on the keyboard at an early age, they have a much better chance of building up high accuracy and wpm test scores through typing practice. They can start this as early as the first grade, but their hand span and the length of their fingers can cover the entire keyboard area comfortably only by the time they are 7 or 8 years old. By this age, they can start building their typing test wpm speed. Why Teach Touch Typing Lessons in School? When learning touch typing, the fingers develop muscle memory. This improves the child’s cognitive and motor skills, and hand-eye coordination; their minds become sharper. It provides an alternative to students who get low grades in school due to poor or illegible handwriting. It helps children suffering from dyslexia to perform better academically. They do not need to concentrate on the keyboard, so they can focus on what they want to type and produce better content. Primary school children cannot write more than 15 words per minute by hand, but if trained well in touch typing, they can manage at least double that speed in the same amount of time. They will be given preference at job interviews. They can complete computer-based tasks faster and be more productive. They can have a real-time conversation with friends and family who live abroad as they chat on instant messenger without much delays. Parents are realizing the immense benefits of teaching touch typing to their young children. They are on the lookout for private typing tutors during the summer holidays. Schools that include touch typing in their curriculum are in high demand, and an increasing number are moving in this direction. Kids will get an all-round development that will prepare them for a better future as adults. Keyboarding, also known as touch typing, is a necessary skill in order to efficiently use a laptop or desktop computer. Unfortunately, many typing lessons aimed at students learn to type are bland and kids find it hard to stay focused on the material. However, if a typing tutor uses the right methods and products, they can make typing lessons fun and exciting for their students. A great way to make typing lessons fun is to turn each lesson into a game by encouraging your students to type the most words per minute. A wpm typing test will help students practice their typing skills by challenging them to work hard to reach a goal. A wpm typing test should be age appropriate and attainable for students based on their ability. For younger kids, try setting a timer for a period of 30 seconds and make the goal small so it’s easy to accomplish. For older children you can make the time period of the test to be at least a minute long. They key to encouraging students to participate is to offer positive feedback and give them several chances to try to beat their highest wpm. 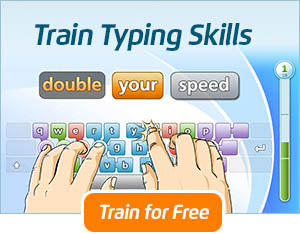 There are a lot of free typing lessons online that a typing tutor can use. This can help break up the monotony of using the same lessons over and over. These lessons usually incorporate games they are so fun that the student doesn’t even realize they are learning. In fact, most students prefer learning keyboarding online because of the variety of lessons that are offered. A tutor can offer a lot of variety by utilizing all of the resources that are available to them. Boring workbooks no are longer needed for a student to achieve an adequate amount of typing practice. A simple internet search will reveal a variety of results for online typing lessons that are not only fun, but free too. You can encourage kids to have fun in your typing class by setting goals for them to meet and offer incentives for meeting those goals. By setting goals students can have something to work towards and won’t feel like their efforts are going to waste. The incentives you offer can be some type of certificate or a small prize of some sort. In conclusion, typing or keyboarding classes do not have to be boring. You can make them fun by utilizing the above tips. By doing so you will encourage kids to want to learn how to type and typing class will become the highlight of their week. Just remember to change up your lessons often as well as to offer continuous praise in order to for your students to successfully meet the goal of learning how to type proficiently. In today’s world of texting, entire conversations can consist of very few words. Common texting phrases include LOL (laughing out loud), TTYL (talk to you later), U (you), and many more, and many individuals actually use these phtases when keyboarding online. While it may be easy to look at the size of a keyboard on a cell phone and think that the size of the keyboard is responsible for this new way of communicating, it is interesting that these code words are also used in emails and various communications that take place via computer keyboarding. This type of coded speech is becoming increasingly popular, and while it may be perfectly fine for social communications, it is often frowned upon in the business world, as it is considered slang, and professional communication is of the utmost importance. Since most office jobs require applicants to have a certain amount of typing experience, there is usually some sort wpm test or typing test that is part of the application process. While applicants that are excellent and fast “texters” may think a typing test wpm will be a breeze, they run into a problem when they realize that they actually have to type full words and sentences. One way for a master “texter” to prepare for a job application process like this is by taking typing lessons where they will learn the basic typing techniques of the English language. It is also a good idea to schedule an hour or so of typing practice per day in order to sharpen their typing skills before a job interview. This is a way for individuals that are so ingrained with texting techniques to learn to type in the standard fashion. While texting is an easy way to communicate without wasting time, it simply doesn’t work in an office setting. An office manager may be able to overlook a few text codes that were keyed in by mistake instead of the entire word, but it is very important for employees that are required to type to be mindful of these typing differences. By making the conscious choice to leave texting for after work hours and standard typing for when the employee is at the desk, it will soon be easy to separate the two, avoiding careless and unfortunate typing mistakes. While it is almost certain that texting is here to stay, knowing the difference between texting codes and what is acceptable language for a work document is extremely important. For a prospective job applicant that finds themselves a bit concerned about taking a typing test, there are free typing lessons as well as sites where they can learn the basics of keyboarding online before taking the actual test, and even working with a typing tutor can prove to be extremely beneficial. By taking the initiative to learn standard typing techniques, hopeful employees will be able to land that job and set texting aside until the workday is over. Does WPM Really Matter in the Corporate World? In this fast-paced world, time is money and everything needs to be done in the shortest time possible. You see that several job postings include a minimum typing speed in terms of WPM (words per minute) in their list of requirements. With the widespread use of computers, almost everyone knows how to type. 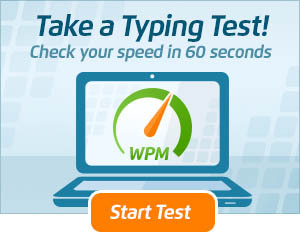 The real question is how fast you can type, which is measured by taking a standard wpm test. It is not only the typing speed; accuracy also matters. This is measured in terms of percentage and most employers expect 90% or more. You don’t need to worry much if you haven’t done great on a typing speed test just yet. Only a few types of jobs insist on applicants taking a wpm test and achieving a high score in the range of 90 – 100 words per minute. Data Entry Operator: Typing is the primary task in this role. The data entry operator needs to enter vast amounts of data into the computer database. Examples of this data are stock inventory and customer details. The repetitive nature of this job can make a person tired or bored, so the challenge is to maintain a high level of accuracy. Customer Support Staff: When providing customer support via e-mail or chat, your typing test wpm is a measure of your performance and efficiency on the job. You are dealing with a customer in real time and they expect fast replies to their queries. Administrative or Legal Assistant: You need to send out various kinds of correspondence, and prepare reports and other documentation. There are so many tasks to complete in so little time; the higher a wpm test score you possess, the more you can get crossed off your to-do list and prevent work from stacking up. Secretary or Receptionist: A person working in this role needs to fill out forms, take dictation from bosses and write minutes of meetings. Bosses are busy people and don’t have much time or patience for slow typists. Medical Transcription: Typing test wpm speed definitely matters in this job because you are converting audio content into textual form. However, accuracy takes precedence because of the critical nature of the medical records of patients. Court Reporters: These workers type out the entire conversation in the court room and cannot afford to miss out a single word. They use stenotype machines that work like typewriters but with a keyboard layout different from the regular QWERTY one and undergo specialized training to achieve super-fast typing speeds. There are many free typing tests and tutor programs available online. The more you take, the faster you will become. 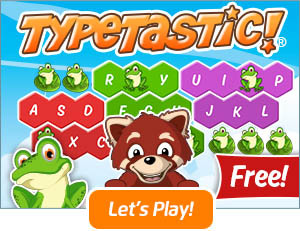 A free typing test can be fun to do and some are even presented in the form of a game. A typing speed test is of two kinds; one where you need to read the source text and the other where you hear it. Take several tests of each to improve your typing skills. You need lots and lots of practice to train your mind and fingers to know the exact location of the characters on the keyboard without having to look down. These motor skills can be developed faster by maintaining the right posture of your arms and fingers and taking one free typing test after another. Use all your fingers to cover more surface area on the keyboard. Beginners often resort to using the index fingers of both hands to type; the highest words per minute rate that this two-finger style of typing can give you is around 50. This also puts you at risk of getting repetitive strain injury (RSI). Computers, they’re everywhere and they aren’t going away anytime soon. Many of the tasks that we used to perform with a pen and a pad of paper are now being done on our computers, laptops and PDA’s. Everything from sending emails, writing reports, even scheduling our workdays is going digital. Do you know how touch typing could help you with these tasks? It used to be that touch typing was a skill reserved for courtroom stenographers, transcriptionists and maybe a few writers. But, in today’s digital age all that’s changed. Touch typing is now a skill that anyone can learn and with regular practice can be quickly and easily mastered. So, why learn touch typing? Touch typing can drastically improve your typing speed. Maybe you have been using the hunt and peck method all of your life or some variation of placing all 10 fingers on the keyboard. Either way, these methods are incredibly slow compared to touch typing. Using a program like TypingMaster Online can help improve your typing speed dramatically in a short period of time. Not only does this skill make you more attractive to employers, but it will help you become more efficient and can save you time as well. Think about this: if you are currently typing 20 words per minute (wpm) that means it would take you on average about 30 minutes to type up a one page document. Factor in time to think about what you want to say and the time it takes to start and stop if you need to look at the keyboard and you could be looking at close to an hour to get that task done. By learning touch typing, you could boost your typing speed to 40wpm or even 60wpm and drastically cut down the amount of time it takes you to do even the most simple tasks. Not only will you become more efficient, but you will also be able to direct your focus to where it counts. Think about every time you have to look at the keyboard to find the right key. Or, maybe you find yourself constantly making mistakes and having to go back and make corrections as you type. Each time this happens, it breaks your focus and become distracted. Touch typing can teaches you to rely on motor memory rather than sight to type, freeing you up to direct your focus on the screen instead of the keyboard. If you spend a significant amount of time at a desk, in front of a computer then you probably know that sitting and typing can take a toll on your body. Achy shoulders, stiff neck and sore wrists are some of the side effects of poor posture and bad computer habits. As you learn the proper way to sit and cultivate better habits, your arms and shoulders will relax and your energy levels will stay consistent throughout the day. Touch typing isn’t just about increasing your typing speed and reducing errors, it’s about adopting healthy computer habits to reduce the risk of injury and provide increased comfort. By learning the basics of touch typing, you will find your work and personal life to become much more productive. Type emails, reports and chat at the speed of your speech and see the results as you get more done during your day. Whether you are an educator, employee or student, TypingMaster Online an help you save time, become more productive and make typing more enjoyable. Experience for yourself the benefits of touch typing, take TypingMaster typing test now and find out your typing speed. While accurate typing skills and speed have been a job requirement for decades, in today’s computerized world, passing a typing wpm test can literally be the deal breaker when it comes to landing a job. When applying with a staffing company for instance, all applicants are required to take and pass a typing speed test in order for the staffing agents to place qualified employees in various positions, and many companies that offer online applications will include a free typing test where applicants are usually directed to a free typing test site. While this may seem like a breeze at first, many accurate typists will find themselves with a low score or literally failing the test. It usually comes as a surprise, especially to people that consider themselves exceptionally fast when it comes to typing. The reality is the actual tests are what slows down the typing speed, and there are a variety of reasons for this. Nerves are the number one reason that individuals may receive poor words per minute results when taking a typing speed test. When typing freestyle, there is no pressure to finish in a certain amount of time, and the individual isn’t concerned about the end result. They are not keeping track of their words per minute, as they are simply typing in a way that is comfortable for them. Typing tests are timed, and most online or computerized typing tests do not allow the typist to correct their mistakes. When typing freestyle, if a mistake is made, the typist can immediately correct the issue without losing time. Once a typist makes a mistake on a wpm test, the mistake is underlined, which can add even more pressure, and the end result can be the loss of a job opportunity. Touch typing is a skill where the typist can accurately type at a fast words per minute rate without having to scan the keyboard. Scanning the keyboard at a slow pace is often referred to as hunt and peck, and this particular typing practice causes a very low typing test wpm rate. Transcriptionists tend to be excellent touch typists due to the nature of their job, and this skill comes in particularly handy. The best way for someone to build up their touch typing skills is by constant practice, as the typist will become more and more aware of where the keys are located by simple touch. Standard typing test wpm rates tend to be higher in individuals with a knack for touch typing versus individuals that use the free flow method. Free flow typing is commonly used in today’s world, and it combines touch typing, keyboard scanning, and the true hunt and peck methods. Basically, individuals type in a way that they are most comfortable with, which in turn brings amazing results. More and more companies are offering free form typing tests, and this type of free typing test allows the applicant to simply type whatever they want into a box. These types of tests work much better and are extremely beneficial for employers, as they will have an accurate idea of how fast the typist can type. The typist is still given a certain amount of time as they would be given in a standard typing test, usually 1 or 2 minutes. When the time is up, the test will lock and the typing test wpm rate will be displayed. If you are someone that is getting ready for a job interview where a typing speed test is required, a good way to prepare is by taking a free online typing wpm test beforehand. There are both free flow and standard tests available, and by taking both tests, you can compare your results and learn your true typing speed. This will not only help you prepare for your interview, it will also help ease any nervousness you may have regarding the standard typing test. Knowing your true speed will give you the confidence you need to master your wpm test and help you land that job. It may not seem like a big deal to you, but your typing skills may be placing you right out of a job. Well, more specifically – your lack of typing skills, that is. Maybe you use the “hunt and peck” method, or some variation of the ten fingers touch typing method. Maybe you notice yourself looking at the keyboard often, searching for that one elusive key right under your pinky. None of these, by the way, equate to marketable typing skills that might help you land a job. The fact is this: that typing class you may have paid minimal attention to in school, could totally have landed you that job you just applied for. Don’t believe me? Consider this; computers are a larger part of our lives now, than ever before. Most jobs require at least the most basic computer skills, even jobs that 10 or 15 years ago did not. In fact, many employers are requiring candidates to be able to type at least a minimum of 35 wpm just for the sake of productivity. There are a variety of reasons that employers are looking for people with above average typing skills. More importantly though, are the benefits that honing these skills can give you. It’s not just about making yourself attractive to potential employers, learning a skill such as touch typing can help you get ahead in a number of ways. It might seem ridiculous to you that there are people out there that can type 200 words per minute, but believe me – they do exist. And, the starting pay for some of these jobs isn’t too shabby either. So, if you think that touch typing is a skill reserved for some secretary sitting behind a desk with a dusty typewriter, think again. Touch typing is a skill that many of us can benefit from. It not only makes you more marketable but, opens the door to more opportunities and helps to simplify our day to day activities. On average, it takes most people about a year of regular practice to efficiently work up to typing 60 wpm without error. However, a course in touch typing can help you achieve an in-depth understanding of this important skill in as little as 5 course hours. For those going through such a course, improvements in typing speed and accuracy can be seen in as little as a week and a comfortable typing speed can be achieved in about a month. Of course, when it comes to touch typing, like any learned skill – practice makes perfect!